The fear of losing our teeth is something many of us experience. 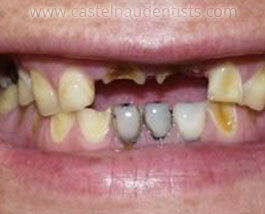 Today however thanks to Dental Implants, tooth loss does not have to be a permanent problem. Our dental implant system provides a safe and reliable method for replacing teeth, whether you have lost one, several or all of them. Your new teeth will look and feel natural, and allow you to live, laugh and enjoy life with total confidence. Dental implants work just like your own teeth, with a similar look and feel. The root that supports the new tooth is made from titanium and is placed into the gum to form a secure foundation, whilst the replacement tooth is fitted on top to create a comfortable, life-like replacement. Who would carry out my treatment? Here at Castelnau Dentists, we are proud to restore the smiles of our patients with dental implants from Nobel Biocare® - an innovative company with market leading dental implant systems of the highest quality. Treatment is carried out by our team of highly experienced dentists - who have a special interest in surgically placing and restoring dental implants. With a gentle, caring approach and vast experience of placing dental implants, we are able to help put the minds of even our most nervous patients at ease. 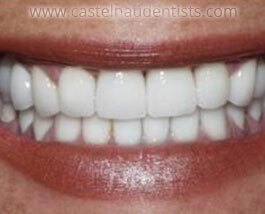 At Castelnau Dentists our approach is simple, we believe in offering the best in personalised dental care and state of the art technologies set in the comfort of a relaxed and safe environment. This means we believe in ensuring each of our valued patients feel fully comfortable and confident in every step of their treatment. Taking the time understand your concerns as well as your aspirations for your new smile, our highly experienced team will clearly explain how Dental Implants could change your life and help you smile with confidence. whiles answering any questions or queries you may have, our aim is to help you find the right treatment for you, based on your budget and individual requirements. Together we are caring and supportive in our approach, and dedicated to providing our patients with dental treatment of the highest standard. We operate an open and honest pricing policy, as well as provide detailed treatment plans so that our patients know exactly what is involved in treatment before we begin. We are proud to offer the best in personalised dental care and state of the art technologies set in the comfort of a friendly, relaxed and safe environment.